that is such a good play! Ahhh! I love Little Shop of Horrors. I was just singing "Somewhere That's Green" the other day. 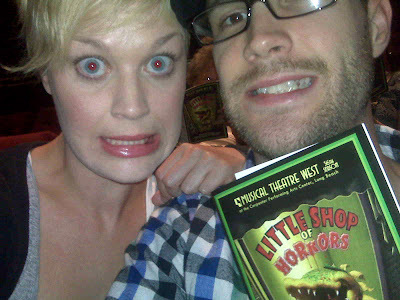 I've loved Little Shop of Horrors since I was little!!! I'm glad the show was good! I love that film, it's so funny and Audrey II is pure love ;P! Little Shop, you say? Only one of my FAVORITE shows! I was Audrey way back in the day in one production, and a Doo Wop girl in another! I love laughing with my husband where nobody else is. Haven't left a comment in a while, so I thought I'd say hi and I hope your weekend is/was great! so fun! I played Audrey at my all girl's catholic school production....it was awkward to have all of the characters played by women!